Cahill’s goal – a poor headed clearance from Gallas drops to Cahill on the edge of the box. His sweetly struck volley brushes Steven Caulker on the way past, and beats Friedel. A Chelsea corner is played deep to the far post, where Gallas and Walker are underneath it. Gallas inexplicably heads the ball back towards the centre of the penalty area, rather than either putting it out for another corner, or trying to flick it on for a throw in. Cahill has drifted away from his marker, Caulker. Cahill hits a wonderful first-time volley, which Caulker attempts to block. The deflection is what beats Friedel – the ball effectively goes straight between his hands, but it is difficult to blame him as it was certainly diverted off-course by the nick on the way through. Juan Mata’s first goal – another poor Gallas clearance is punished, as Juan Mata finds the bottom corner with a precise finish. Chelsea build a move down their right-hand side, and get bodies forward in support. As the ball is moved wide, Spurs seem to have enough bodies back to deal with the move. Oscar’s cross is low, but played more “into an area” than to anyone in particular. Gallas awkwardly tries to clear up-field with his right foot, when hooking it away with his left would make more sense – as a result, he makes a real mess of his clearance. 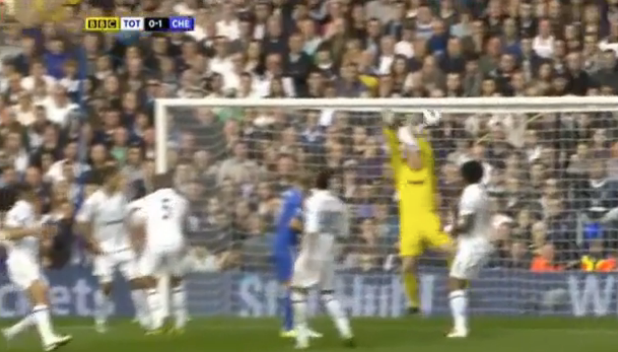 …and finds the bottom corner – Friedel doesn’t even move. Juan Mata’s second goal – after clever link-up play with Oscar and Mikel, and a wonderful pass from Hazard, Mata runs in behind Gallas and finishes well. Oscar has possession on Chelsea’s left – he finds Mata, who is pursued by substitute Jake Livermore. Mata lays off to Mikel, and immediately makes a dart in behind. Mikel helps the ball on to Hazard, with Mata now in a lot of space – Livermore not having tracked his run. Hazard plays the perfect pass – first time and in behind Gallas, who is not alive to Mata’s run – does Walker give him a shout? The ball is perfectly weighted into Mata’s stride. Once he is one on one, Mata finishes clinically, giving Friedel little chance. Daniel Sturridge – Kyle Walker fails to clear the ball, dallies, and is eventually robbed by Mata, who tees up Sturridge for a back-post tap-in. Kyle Walker has possession for Spurs, and doesn’t want to hit the ball long – instead, he should turn and play the ball back to Friedel, in order to keep possession. Instead, he attempts to take on and beat Mata. He retains possession, but still doesn’t take the opportunity to clear the ball. Mata backs him into a corner, and robs him of possession. He scampers into the box, and has bodies in support. …and Sturridge has the simple task of tapping home. Surprised you didn't mention Verts in the second goal. Got tackled upfield and never tried to get back leaving Oscar vs Huddlestone at LB. This sounds strange, but sometimes that happens and you just have to accept it - it's how you cover that becomes important. Vert couldn't chase the ball because the Chelsea player passed the ball fast to a forward position. Hudd, who was covering the LB position, was unable to follow the pace and defend properly!!! Seconds before that I had said to my friends with who I was watching the game that we were in a great danger to concede a goal because Hudd is unable to defend. Indeed, seconds after we had conceded a goal. Hudd's (correct) substitution came only a few seconds too late!! Vert had nothing to do with that goal. Yeah, he did. The reason he'd been caught upfield is because he'd had possession in our left-back area, and played a bad pass up the line- 1 of 3 similar instances in the 2nd half. He chased up field to win the ball back, and did- but then was tackled again, and thought he was fouled. Everyone stopped for a second, then Chelsea started their move down our left; Vertonghen was well out of position. He was easily one of our best 3 players on the day, so doesn't deserve a lot of criticism, but his 2nd half included a few mistakes. Him + Lennon + Defoe were the only ones who looked like they wanted to take responsibility for our play, and that always means a bit of risk. Obviously it was disappointing to leave the ground with nothing, but given how deflated I felt when I saw Bale & Dembele missing from the lineup, and how uncohesive we were in the first half, I was dead pleased with the same 11 coming out fighting in the 2nd half, and we could easily have gone 3-1 up or equalised at 3-3. They're an excellent side, we'll be fine. Agree with almost all of this, thought Vertonghen had one of his least good games for us but excused this as he had no one in front of him for most of the day, where were Dempsey and Gylfi playing?? Thought Lennon and Defoe were close to outstanding. Its true that Jan was in a way culpable for their second goal. He lost the ball and didn't appear interested in sprinting back. I thought Vertonghen was excellent. An assist, great cross, goal-saving sprint back, winning headers...I guess he didn't do everything possible. If he had been writhing on the ground for no reason like Bale, I guess we'd cut him a little slack. He is playing out of position, isn't he? I was pleased with the overall effort and very hopeful for the future. or the fact for the 2nd goal, as mentioned on MOTD last night, that Sigurdsson and Sandro allowed Mata so much space to run through before laying it off to Oscar? And correct substitution in place of the useless Livermore who always seems to contribute nothing but to us conceding goals further? Baring in mind the state of the game he came on at I don't think he did much wrong. I am more worried that at the point we were gearing up to defend a 1 goal lead, again, and lost it, again. (1) Got to say I hope you're never a parent. Totally disagree re: Bale, personally. I think it's harsh to hold Vert responsible - turnovers happen up the pitch, it's how you deal with them that is crucial..
Agree re: Bale and ESPECIALLY Dembele, who we really miss. Dempsey just got off the plane from the US. Too tired to do much. Ade should have started. What's going on there? 451 allows us to use full backs to bomb forward and relieves the defensive duties of left and right wing by always having a man overlap going backwards. I suspect seeing as the chelsea set up is similar AVB was more concerned with this than changing the formation to accomodate Ade. Gallas, for godsake, stop getting the ball and wandering into midfield with it ignoring runs for passes until you get tackled in midfiled and leaving a counter and only Sandro/Parker and Caulker/Kaboul/Dawson/Vertonghen (pick which ever ones were playing in the many many games he has done it in) to defend the counter. Stop running to the near post for a cross from their right and cutting off your fellow Centre Backs route, that's their job, you block the secondary run. Hitting the front post means Walker is being pulled in closer than he needs and having to cover the runner you should be on as well as the late run should there be one. Stop playing half their team onside and then stopping with your arm up in the air wondering why play has gone on. Against Man Utd he raised his arm for off side whilst half of our team and half of their team were between him and goal. Situational awareness is a crucial part of a CB's game, especially one that no longer has the edge on speed, stamina or strength. This has been going on since Easter, it's not outright dislike of the man because I think he is a great defender, but it's the same little things each match that could have been avoided, he is at the point where he has lost that vital inch and needs more rest than play in a week, everything that was said about Ferdinand when we played utd could be said for Gallas. He can still perform but needs to look after number one in a game, and probably best if not used for a full match or played no more than two out of three. Caulker looks absolutely solid, Vert is fantastic, his LB play has ups and downs and he seems to want to play CB so who am I to say no, And we know about Kaboul, those three are a great future as our core CB's, with injuries though we are picking a 4th which should theoretically be between Gallas and Dawson, but for some reason Gallas is 1st name on the sheet, even it seems if we had no injuries. SPOT ON re Gallas. Such a frustrating player - when you see how good Caulker/Vertonghen are on the ball, it's very irritating to see Gallas' lack of quality/composure. Looking forward to Kaboul and BAE coming back. Some of the poorest defending by Spurs for a while. there was some terrible marking for the first Mata goal, when Hazard just wandered into a central areas with 8 defenders round him (count them) but not one within 5yds of him. The first time ball to Mata was brilliant but again no-one goes with Mata. The same happened when Torres should have scored from the left. This time it's Mata left unmarked. WE still should have drawn it. Sigurdsson alone had four clear chances and Gallas missed a good chance from the free kick on 3mins..
Two goals should be enough at home. Excellent points as ever, Jimmy.